50-pack. For patient prioritization. Approved by CA Fire Chiefs Association. Easy to use and understand. Front and back body diagrams. Color coded tear-off triage classification at bottom. Tear-off contaminated evidence tag. Extensive treatment sections. 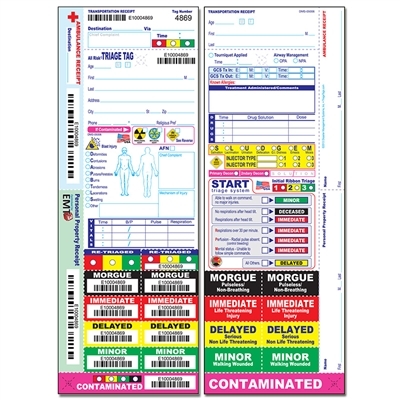 All sections are bar coded for easy identification of multiple patients. Water resistant.